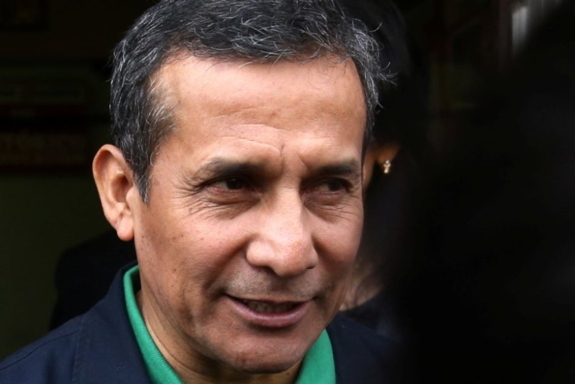 LIMA (Reuters) - Peru's former President Ollanta Humala and his wife turned themselves in to authorities late on Thursday after a judge ordered them to spend up to 18 months in jail while prosecutors prepare charges against them for alleged money laundering. The ruling by Judge Richard Concepcion, which triggered jeers from the couple's supporters during a public hearing that stretched over two days, marked the second time he has mandated jail time for an ex-president since a massive graft scandal in neighboring Brazil rippled into Peru. "Here's a president who rose to the presidency and governed us with an electoral campaign built on illicit money. That's serious because it morally wounds society," Juarez said. "This confirms abuse of power, which we will face in defense of our rights and the rights of all," Humala said on social network Twitter, as television showed images of the couple walking into a building of holding cells, escorted by police. Humala's downfall jolted Peru's political system, though he is not expected to run for office again. Rightwing groups celebrated his downfall, while leftists urged prosecutors to investigate Odebrecht's links to conservative politicians. President Pedro Pablo Kuczynski has said he might pardon the rightwing Fujimori, who is now serving a 25-year sentence for human rights violations and corruption, in a quest for better ties with Fujimori's supporters in Congress.